The pattern and colors are what I love about this rug. Goes with my wood floor. Superior is delighted to introduce the Pastiche runner collection. Woven and crafted for strength and durability in 100 percent polypropylene fibers, this constructed pile meets ISO 9001 certification, has the beauty and suppleness of a traditional pile that is altogether practical, durable, and colorful. 8mm pile height has a comfy feel and can also hold up to high traffic areas in your home. This degree of excellence at an affordable price defines outstanding value. Vacuum regularly to maintain the quality durability of this fine fabric. With over 200 designs available, Superior offers the most attractive area rugs for infinite decorating possibilities. Our breathtaking selections are guaranteed to impress your guests, family members, and friends. Liven up or complement your décor and fine floors in the foyer or entryway, back door, living room, dining room, kitchen, in front of the fireplace, hallways, and bedrooms. Available array of various sizes, colors and patterns make decorating floors easy, entertaining, and enjoyable. 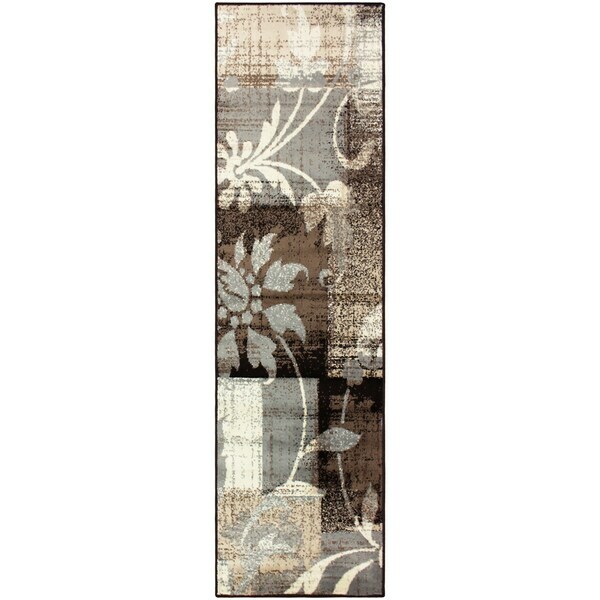 This runner is just as lovely as its name displaying a hodge podge of colors brown, ivory, beige, and grey in a patchwork, European style floral pattern. Care instructions: Shedding is a normal occurrence and will reduce over time with frequent vacuuming. It is also recommended that you vacuum regularly to prevent dust and crumbs from settling into the roots of the fibers. Avoid direct and continuous exposure to sunlight. Do not pull loose ends; clip them with scissors to remove. Turn occasionally to equalize wear. Remove spills immediately. If liquid spills over, blot with clean, undyed cloth by pressing firmly around the spill to absorb as much as possible. For hard to remove stains, professional rug cleaning is recommended. This is a nice enough rug. It looks like the picture. It's medium thickness and very soft. I would recommend using a mat underneath it because it slides otherwise.